More than 200 participants including mayors, councillors, entrepreneurs, artists, waste experts and civil society participated last weekend 8-9th October in the first international Zero Waste meeting for municipalities. 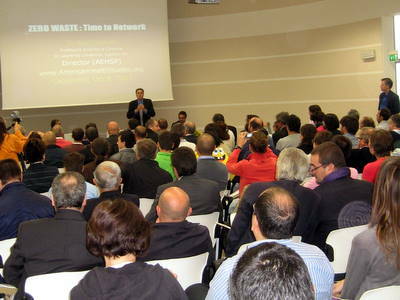 The path that started 4 years ago by Capannori, when mirroring itself with San Francisco decided to declare the Zero Waste goal for 2020, is now followed by 56 municipalities (the objective for the Zero Waste Italy network of municipalities is to reach 100 ZW municipalities for 2012). What started as a grass-root movement that no political party wanted to support is gaining political momentum across the political spectrum. The last incorporation to the ZW network was the city of Naples, the vice-mayor of which attended the gathering and declared the commitment of the recently elected city-council to turn around the bad image of Naples. Indeed, the change has come to Naples where for the moment 165.000hab are being the first ones to experience the door-to-door separate collection system with encouraging results of 66% separate collection. The plan is to slowly expand the new system around Naples and show the world that if ZW is possible in Naples it should be possible anywhere. The meeting included impressive presentations from the city of San Francisco but also successful experiences from Sweden, Wales, Catalonia and the Basque Country, Spain. The town of Hernani in the Basque Country after only 2 years of implementation of the door-to-door collection system saw the recycling levels more than double and now stands at 80% showing the Zero Waste path in the Gipuzkoa region. During the meeting the documentary “Zero Waste” from Victor Ibañez was screened for the first time and the plan is to screen broadly around Italy. Below you can see the trailer. During the second day the meeting of the Zero Waste Research Centre focused on the topic of bad-design; following the composition analysis of the fraction that could not be recycled and has to be sent for disposal. The participants discussed with the experts possible alternatives to take out of the residual waste (the waste that cannot be recycled) nappies, shoes, coffee-capsules and some plastics. Thanks to the Zero Waste strategy Capannori has been the cradle to successful experiences that are now being replicated elsewhere; packaging-free shops such as Effecorta (which is now opening in other places in Italy), reusable nappies companies such as Ecobimbi, reuse and repair centres such as the ASCIT center inaugurated this last weekend by the mayor of Capannori and the vice-mayor of Naples. The last initiative is the re-shuffling of the shoe-making industry, one of its most traditional ones, with the design of long-lasting, toxic-free shoes with biodegradable soles. The parts of these shoes can easily be separated in order to increase the recycling potential. The goal is to keep and increase local jobs with good salaries. All in all, a very inspiring meeting that continued to increase the commitment, the motivation and reach-out of the Zero Waste thinking in Europe! What started as a grass-root movement that no political party wanted to support is gaining political momentum across the political spectrum.